Every year, millions of people experience shoulder pain and seek help from a doctor. While many of these people have a minor issue that can be treated with rest and physical therapy, some people have a torn rotator cuff, which needs treatment from an orthopedic surgeon. Here is everything you need to know about experiencing a rotator cuff tear and undergoing surgery to repair it. The rotator cuff refers to the four muscles that form tendons around the shoulder joint. 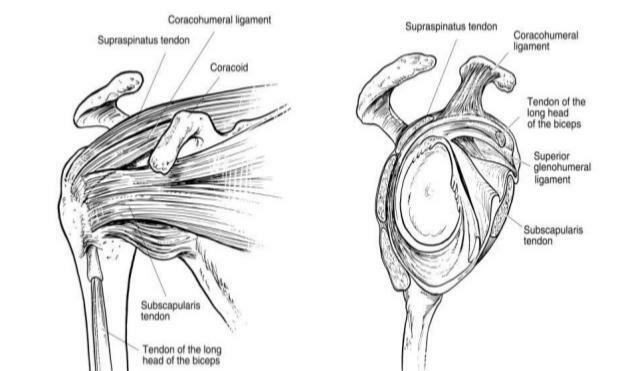 A rotator cuff injury usually means one or possibly more of these tendons has gotten torn. Tears can be partial or complete. Typically, this type of injury is a result of repetitive motion. For example, it is a common injury among professional athletes, particularly baseball pitchers. Additionally, this type of injury becomes more likely with the wear and tear of aging. People over the age of 40 are at increased risk for a rotator cuff tear. While overuse is the more common cause of rotator cuff injuries, an acute injury can also result in a rotator cuff tear. What Are the Symptoms of a Rotator Cuff Tear or Injury? Rotator cuff tear symptoms include the following. Immediate pain: A single injury causes an acute rotator cuff tear. You will likely be able to pinpoint the exact injury because it will involve a quick, sharp pain in the shoulder. Heavy lifting and falls are common causes of an acute tear. Dull pain: In cases of rotator cuff tears that happen as a result of overuse, you likely won't be able to isolate one incident that started the pain. Instead, you will probably notice a continuous, dull ache in your shoulder. Pain while lying down: Whether acute or the result of repetitive motion, most rotator cuff injuries come with pain while lying down on the affected shoulder. You may notice this pain while you are trying to fall asleep. Weakness and restricted range of motion: Weakness in the affected arm is another of the common torn rotator cuff symptoms. Injury to the rotator cuff can make it difficult to move your arm in different positions. These muscles and tendons play a significant role in allowing you to move your arms above your head. If you have this type of injury, you may find it difficult to perform simple tasks that involve lifting and rotating the affected arm. How Do You Know If You Need Surgery? Not all rotator cuff injuries require surgery. Depending on the severity of the injury, your doctor might prescribe more conservative treatments first. Simple at-home measures like rest and ice can help manage your symptoms while you undergo physical therapy to strengthen the injured tendons. Targeted physical therapy exercises will help you regain strength and range of motion. Your doctor may prescribe anti-inflammatories or inject cortisone directly into the injured shoulder. More conservative approaches to treatment may only temporarily provide rotator cuff pain relief. If the injury is a severe tear that results in constant pain, or it does not respond to more conservative treatment, it is unlikely symptoms will resolve without surgery. Pain and weakness may increase if the tear or tears do not get surgically addressed. If you think you may need surgery, learn more about if you may need one. Shoulder arthroscopy is a technique that can diagnose and treat a variety of shoulder joint injuries. 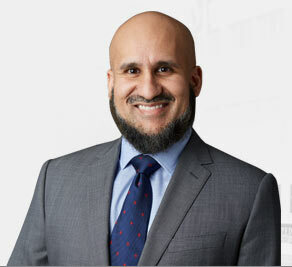 This technique differs from traditional, open approaches to surgery. Instead of making a large incision, the surgeon will make several smaller incisions —usually about half an inch — to reach the injured tendon. Next, the surgeon will insert a thin camera, called the arthroscope, into one of the incisions to get an anatomic visual of the injury and surrounding tissue. The other incisions allow for the insertion of specialized surgical tools that assist the surgeon in removing scar tissue and bone spurs, both of which can contribute to the painful symptoms of a rotator cuff tear. The surgeon will also use plastic screws and sutures to repair the torn tendon. A torn rotator cuff is just one of the conditions shoulder arthroscopy can treat. Other common indications include labrum tear, ligament tear and repair of frequent shoulder dislocations. Any surgery comes with the risk of complications. While these are rare, it is essential you become an informed patient before deciding to undergo surgery. The potential complications of shoulder arthroscopy include the following. Infection: Your surgeon will take every precaution to prevent surgical site infection, but bacteria are always present in our environments. Signs of postoperative infection include redness, pain, swelling and drainage at the site of the surgical incision. Infections like these typically need treatment with a long course of antibiotics. While you should be aware of this complication, only 0.16 to 1.9 percent of arthroscopic surgery patients experience deep infection postoperatively. Stiff shoulder: A stiff shoulder is one of the more common complications of rotator cuff surgery, with one study finding 20 percent of patients experiencing postoperative stiffness. While this stiffness may be unpleasant, the study found it typically resolved with six to 12 months after the surgery. Lack of improvement: Arthroscopic rotator cuff surgery has a high success rate, but it is not 100 percent. Lack of improvement is not a true complication, but the result can be disappointing for patients. It is possible patients will find they do not regain full motion, strength and function in the shoulder. Nerve injury: Many major nerves surround the shoulder joint, which means there is the potential for nerve injury during the surgery. Research has found just 1 to 2 percent of patients experience nerve damage during arthroscopic rotator cuff surgery. Retears: While arthroscopic rotator cuff surgery can be successful, there is a risk of retearing the injured tendon. The risk of this is higher with larger tendon tears. In addition to these risks, shoulder arthroscopy requires the use of anesthesia. The risks, though slight, of anesthesia include blood clots, heart attack and stroke. Surgery is a stressful experience for many people, but knowing what to expect can alleviate some of that worry. Here are the necessary steps to know. Preoperative clearance: Before undergoing surgery, your doctor will perform an exam to ensure you are healthy enough for surgery. Depending on your overall conditions, additional tests may be necessary. Your doctor will discuss any risks associated with the surgery and give you all the preoperative instructions you need, such as what medications you can and cannot take before the procedure. The day of the surgery: The day of your scheduled surgery, you will need to avoid eating or drinking anything after midnight. 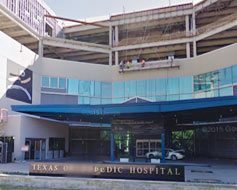 When you arrive at the hospital, you will change into a surgical gown and wait to go to the operating room. Anesthesia: Once you are in the operating room, an anesthesiologist will administer general anesthesia, a combination of medications that will put you to sleep for the duration of the surgery. You will not feel anything. The anesthesiologist may also administer a nerve block, which will numb the shoulder. Nerve blocks last after you wake up, so you will likely feel very little pain when you first wake up from the surgery. Postoperative recovery: You will wake up in the postoperative recovery area of the hospital. After anesthesia, you may feel groggy or nauseous. These sensations are perfectly normal, and will wear off. Most arthroscopic rotator cuff repairs take place on an outpatient basis, which means you will be able to go home the same day as your procedure. How Can You Manage Any Postoperative Pain and Discomfort? Pain management is one of patients' most significant concerns following surgery. Anesthesia and a nerve block will help with pain the day of the surgery, but once you go home, you will be responsible for managing your pain. Your care team will help prepare you to return home to begin your recovery process. 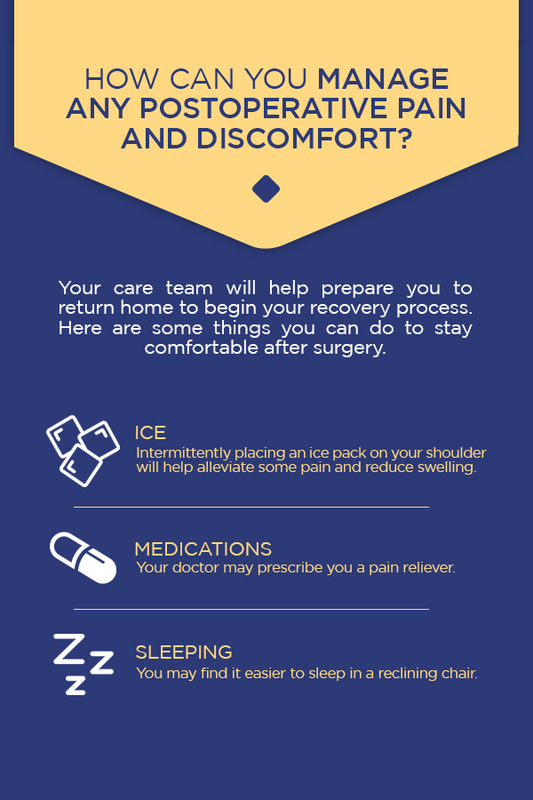 Here are some things you can do to stay comfortable after surgery. Ice: Intermittently placing an ice pack on your shoulder will help alleviate some pain and reduce swelling. While you ice, be sure you do not get the incision area wet. Place a thin towel around the ice and apply it to your shoulder for approximately 20 minutes at a time. Medications: Your doctor may prescribe you a pain reliever. You may also try different over-the-counter medications to help manage any pain. It is a good idea to check with your doctor before taking any pain medication. Some medications can have an impact on bleeding, while others might interact with what your doctor has prescribed. Always follow instructions carefully when taking any medication. Sleeping: Sleeping is a vital part of recovery, but it may be a challenge immediately after the surgery. It can take up to six weeks after surgery to sleep comfortably in a horizontal position. You may find it easier to sleep in a reclining chair. Alternatively, you can prop yourself up on a bed using pillows. Be careful to prop the affected arm up and away from your body. If you prefer sleeping on your side, you can sleep on your other shoulder. Recovery happens in a few different stages. The first step is managing your postoperative pain. Although your arm will likely be immobilized in a sling for four to six weeks after the surgery, you can return to most of your normal activities within a few days of surgery. You will be able to drive and walk, but remember you will be doing these things with one arm. During your recovery period, you will work with your physical therapist to regain motion and strengthen the area. The rotator cuff surgery recovery timeline can vary case by case, but a full recovery typically takes four to six months. It may take longer than that to return to heavy lifting. Talk to your doctor and physical therapist before resuming any workout routines or going back to a job that will put significant strain on your shoulder. What Should You Expect From Postoperative Physical Therapy? Physical therapy is a big part of postoperative rotator cuff treatment. Your physical therapist will start by introducing passive motion to the shoulder. He or she will carefully move your arm for you to ensure the recovering muscles and tendons are not under excessive strain. When you are ready, your physical therapy will progress to active motion, which means your therapist will instruct you how to move your arm. Finally, you will begin to work on strengthening the shoulder with resistance exercises. While you will have regularly scheduled physical therapy appointments, your therapist will likely give you daily at-home exercises to do. Rotator cuff tear rehab will usually last at least a few months after the surgery. How Can You Help Prevent Future Rotator Cuff Injuries? Once you reach full recovery, you will probably want to put the injury out of your mind and move forward with your life. While it is wonderful you can get back to the activities you love, you will want to take precautions to prevent re-injury of the rotator cuff. Exercise: You can continue to do the rotator cuff tear exercises you learned in physical therapy to keep your shoulder strong. Go back to the other types of exercise you loved before surgery. Maintaining physical fitness helps keep your body healthy and prevents future injuries. Don't push yourself: Consider asking for help the next time you need to lift something heavy. If you do want to go back to lifting, either for exercise or work, make sure your doctor and physical therapist have cleared you to do so, and ensure you are lifting in a way that keeps your body safe. If you notice your shoulder feels sore or tender, stop what you are doing. If you push yourself too far, you can retear the repaired tendon or tendons. If you need to get evaluated for a rotator cuff tear, schedule an appointment online or call 713-794-3457. Take the first step toward recovery today.